On June 23 (2016) a referendum will occur in the United Kingdom and Gibraltar regarding continuing membership in the European Union. UK citizens never had the choice about joining in the first place (their self-styled superiors chose for them), but now they would appear to have the choice to leave. Transits and such against the UK and EU horoscopes for the day of the referendum give us some insight. Transiting Pluto square UK nodal axis: a drastic change in destiny? 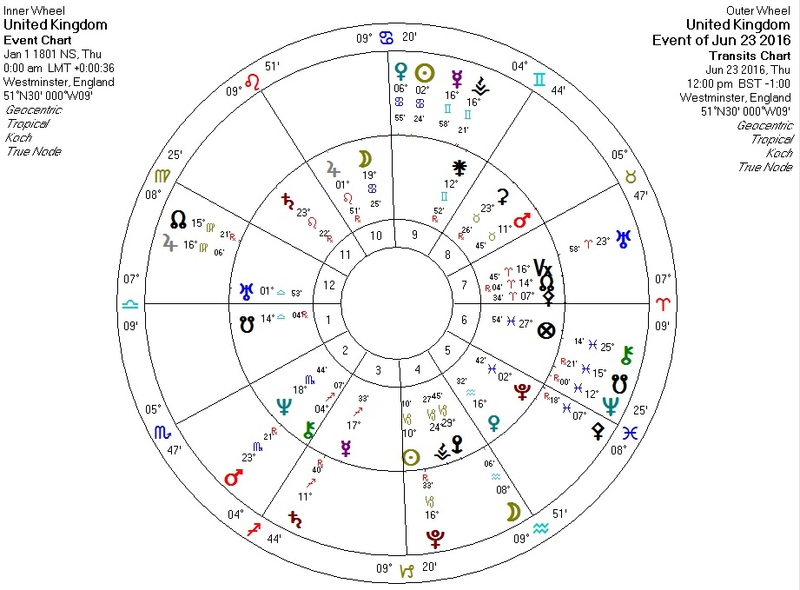 Transiting Pluto opposite UK Moon: destruction of "family"? Transiting Neptune and South Node quincunx UK South Node: loss? Transiting Uranus trine UK Saturn: a surprise which bolsters UK authority? Transiting Saturn quincunx UK Mars: authority in the zeitgeist pressuring UK autonomy? Transiting Jupiter and North Node quincunx UK North Node and Venus: a major gain, possibly social and/or financial? Transiting Pallas semisquare UK Pallas and sextile UK Mars (ruler of Pallas): intelligence/logic/ethics highlighted. Transiting Mars square UK Saturn and opposite UK Ceres: a blow to authority and a loss? Transiting Pluto conjunct EU solar arc North Node: a destiny shattered? 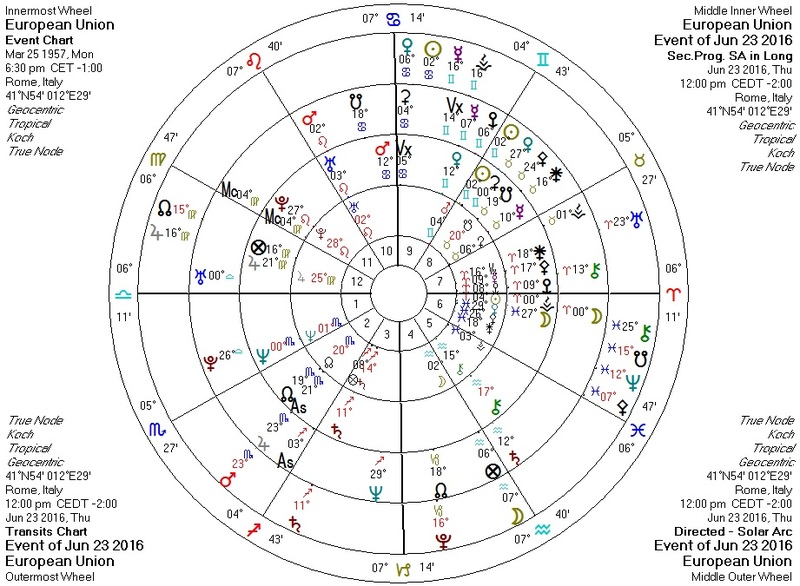 Transiting Pluto square EU Vertex: a relationship facing death? Transiting Neptune square EU Saturn: dissolving of structure? Transiting Uranus opposite EU solar arc Pluto and quincunx solar arc Jupiter: disruption of power and purpose? Transiting Chiron conjunct EU Pallas: an ethical adjustment? EU Saturn Return: chickens coming home to roost? Transiting Jupiter and North Node square EU Saturn: public opinion and the call of destiny against EU authority? Transiting Venus conjunct EU Midheaven: finances/relationships highlighted and/or pleasant developments regarding "family"? Save yourselves, trans-Atlantic brethren! Free yourself from the bureaucratic tyranny of Brussels!